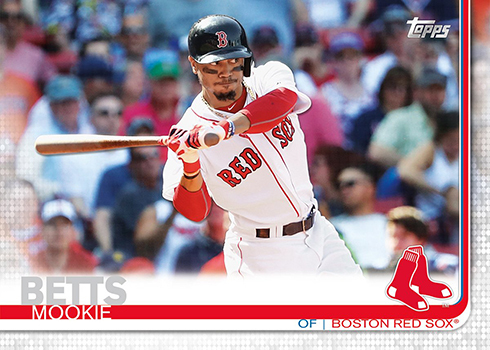 2019 Topps Series 1 Baseball is celebrating the 150th anniversary of professional baseball. And the 35th anniversary of 1984 Topps. 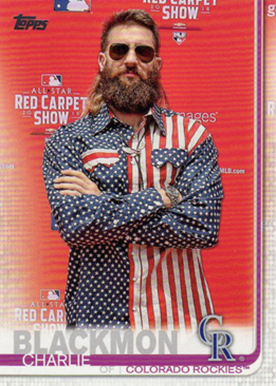 The flagship release kicks off a new baseball card season with an extensive checklist. The 2019 Topps Series 1 base set continues with the 350-card trend of the last few years. That means new flagship cards for veterans as well as Rookie Cards for those who made their debuts in the second half of the season. Among the subsets are Future Stars, World Series Highlights, League Leaders and team cards. Stadiums also get some cardboard love in 2019 Topps Baseball. 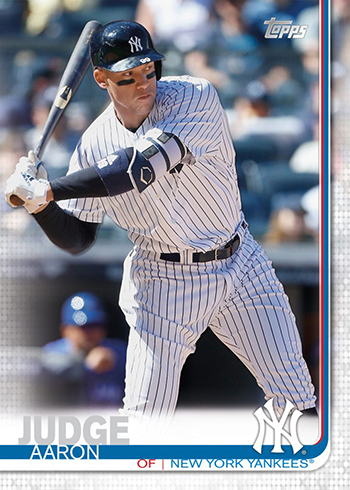 As far as design goes, borders are back for 2019 Topps Baseball, at least on a couple of the sides. Channeling a bit of 1982‘s “hockey stick,” the colors of the inner border change based on the team. There’s also a dotted outer border, which is where parallel colors are apparent. Speaking of parallels, the lineup is deep once again. 150th Anniversary parallels are special to 2019. They’re also among the easier parallel versions, landing 1:6 packs. 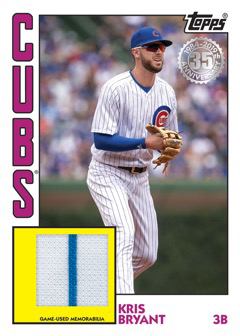 Among the other parallels are: Rainbow Foil (1:10 packs), Gold (/2019), Vintage Stock (/99), Independence Day (/76), Black (/68, hobby and hobby jumbo only), Father’s Day Blue (/50), Mother’s Day Pink (/50), Memorial Day Camo (/25), Printing Plates (1/1) and Platinum (1/1). Clear (/10) returns as a partial parallel of 100 cards. Once again, these are only in hobby packs, not hobby jumbo or any of the retail configurations. Variations return for select cards at both the SP and SSP levels. These offer cards with alternate photos. Among the insert highlights in 2019 Topps Series 1 Baseball is a blast back to one of their most popular designs of the 1980s, 1984 Topps Baseball. Like 2017’s 1987 and 2018’s 1983 inserts, these take the old design and make it new again with both current players and retired stars. Parallels include 150th Anniversary (/150), Red (/10) and Platinum (1/1). 1984 Topps Baseball gets an extensive autograph lineup of signatures from vets, rookies and retired players. The 35-year-old design also extends into new relic versions that have memorabilia embedded in them. Numbered parallels can be found with 150th Anniversary (/150), Gold (/50 and under) and hobby- and hobby jumbo-exclusive Platinum (1/1). Relics also have Red (/25). So do the signatures, but the 1984 Topps Baseball Red Autographs are only in regular hobby packs. 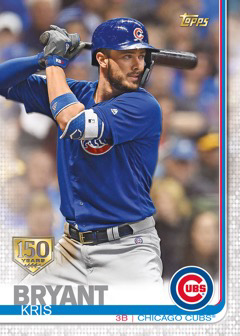 Taking a page from recent Topps Salute inserts of the past couple of years and combining it with the anniversary theme are new 150 Years of Professional Baseball Cards. These take a thematic approach with the checklist breaking down into three sections: Greatest Players, Greatest Moments and Greatest Seasons. These also have 150th Anniversary (/150), Red (/10) and Platinum (1/1) parallels. 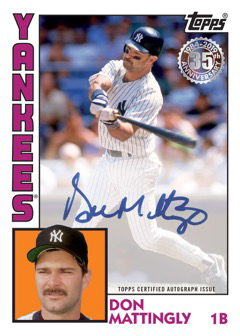 Select cards also have autographed versions that are numbered to 25 or less. Evolution of: inserts look at how different physical aspects of baseball have transformed over more than 100 years. These include team logos and uniforms, equipment and stadiums. Revolution of the Game spotlights players who have changed baseball in some way. Past and present are showcased on Greatness Returns. These inserts take a retired star and join them with a comparable veteran. 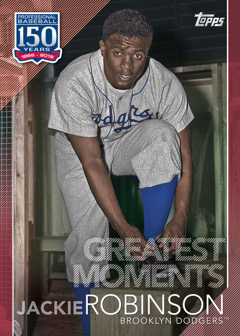 2019 Topps Series 1 Baseball looks to the hobby’s past with Iconic Card Reprints. All regular insert sets above have 150th Anniversary parallels (/150). All except Iconic Card Reprints come with Red (/10) and Platinum (1/1) versions as well. Scarce autographs are randomly inserted for Revolution of the Game (/199 or less), Iconic Card Reprints (/25 or less), Cactus League Legends (/10 or less) and Grapefruit League Greats (/10 or less). Sketch Cards, which come with original artwork drawn on the card itself, are only in regular hobby packs. All are one-of-ones due to the unique nature of the art. Legacy of Baseball Autographs uses a theme that allows for signatures from several generations of players. The parallel treatment is done with 150th Anniversary (/150), Gold (/50 or less), Red (/25 or less) and Platinum (1/1). Scarce dual autograph versions are limited to 5 and under. World Series Champion and Postseason Performance themes return with the “hit” trifecta of autographs (/50 or less), memorabilia (/99 or less) and autograph relics (/50 and under). Parallels are available for both at all levels, although their numbers are small. Major League Material have a somewhat all-encompassing theme for memorabilia. Besides parallels, some cards also have autograph versions (/50 or less). In the Name Relics are back. These have full letters from the backs of 2018 All-Star workout jerseys. While individual cards are numbered one-of-one, players usually have multiple letters available. Historic Homes Relic cards are new to 2019 Topps Series 1 Baseball. These have pieces from old MLB stadiums and fields. Reverence Autograph Patch cards return, but only in hobby and hobby jumbo packs. These come with on-card signatures and premium swatches. Base versions have ten copies each while parallels are available in Red (/5) and Platinum (1/1). Hobby configurations of 2019 Topps Series 1 Baseball have a pair of manufactured relics of their own. 150th Anniversary Medallions take a similar approach as the patches, only with metal. The set other is Retro Hat Logo Patch Cards. Both of these come with 150th Anniversary (/150), Gold (/50), Red (/25) and Platinum (1/1) parallels. There are also autographs (/10) for some cards. For the third consecutive year, there’s a special program of exclusive cards for those buying hobby and hobby jumbo boxes. 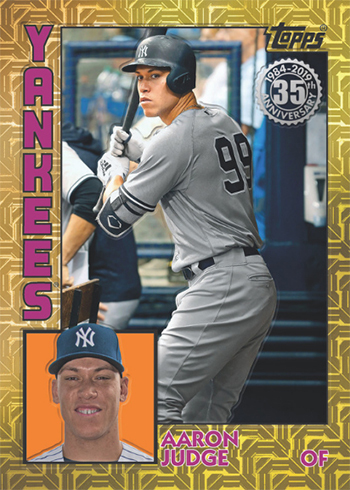 The 2019 Topps Baseball Silver Pack program includes different versions of 1984 Topps Baseball inserts done on different (and shiny patterned) card stock. Parallels and autographs are also available. 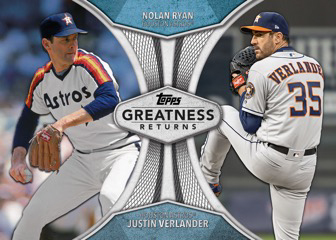 Those buying a 2019 Topps Series 1 Baseball hobby box from a participating dealer gets one of the bonus packs. Hobby jumbo boxes deliver two.